Nothing hidden indeed… except, perhaps the cheese inside a steaming, hot Cachapas. Brittle autumn days require an extra slathering of comfort. Ooey gooey cheese-filled corncakes, a.k.a. cachapas fit the bill nicely. 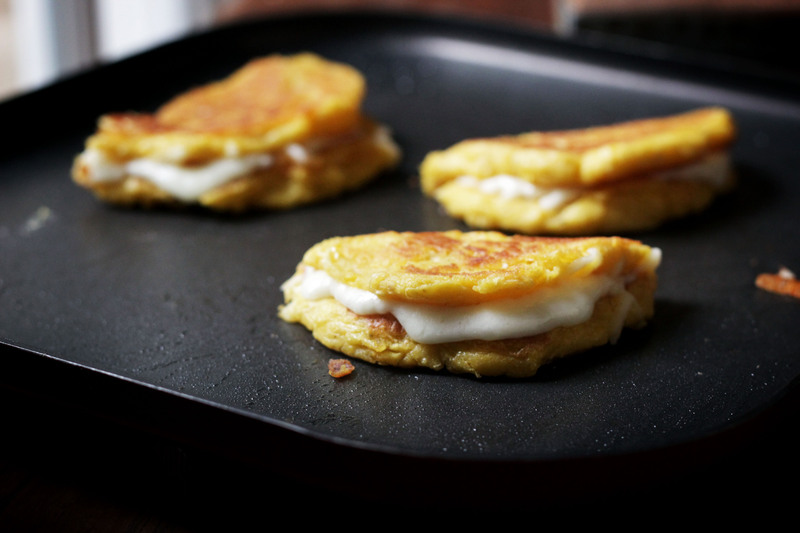 Think of them as the South American version of pancakes. The cakes are made with just two ingredients: corn and masa harina, plus the requisite sprinkling of salt and pepper. There’s a simplicity to the recipe that means a batch can be made as easily at midnight as in the afternoon. Which means you can stovetop travel to the beaches of Venezuela any time you like. 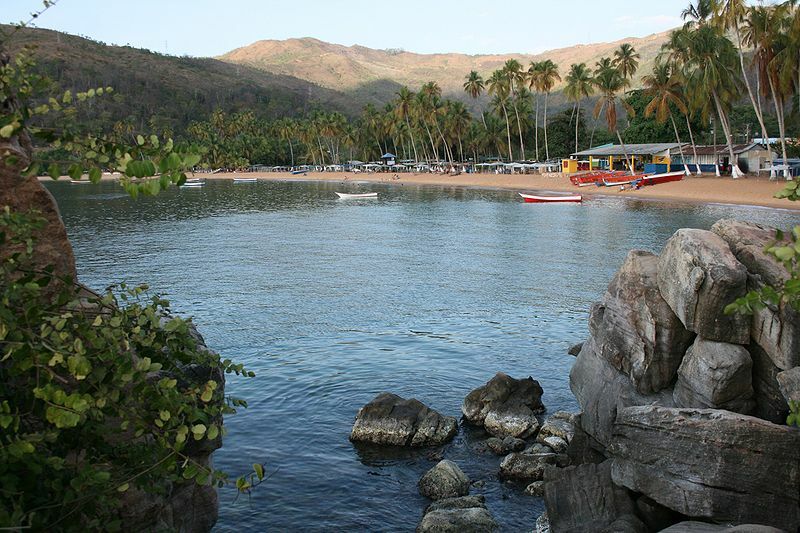 Playa Colorada, Sucre State, Venezuela. Photo by Gianfranco Cardogna. 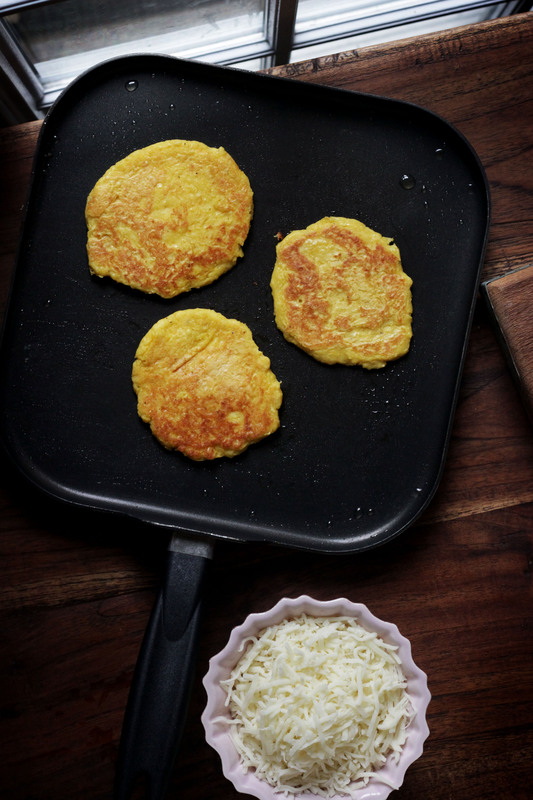 While you can make cachapas with fresh corn in the fall, you can also use frozen corn any time of year. 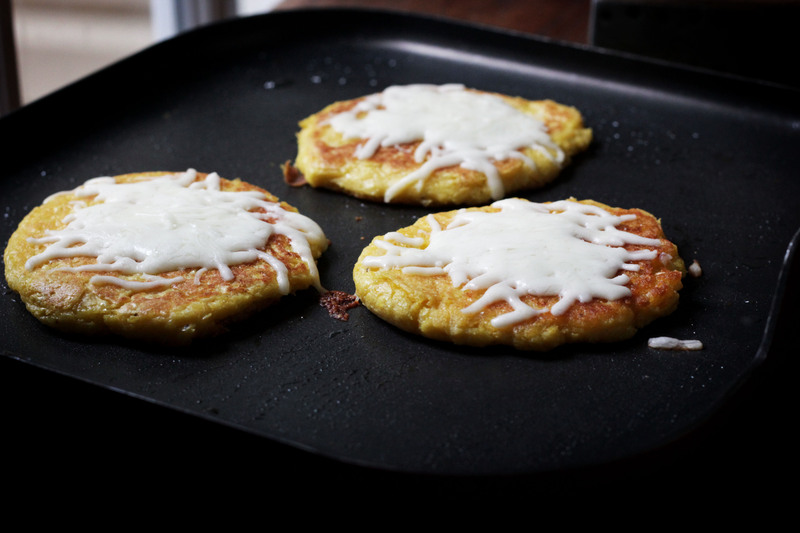 Corn gives the cachapas sweet overtones. 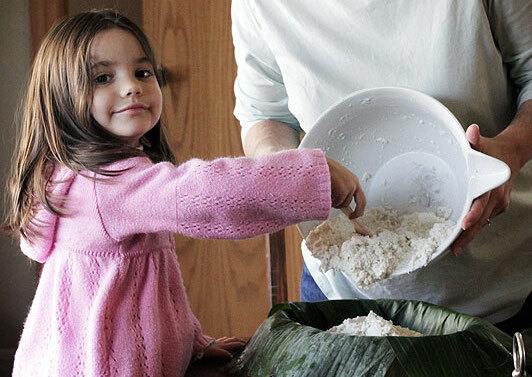 Masa harina – a flour made from hominy, the big-kerneled cousin to corn – binds the mixture together so the corncake holds its shape (all the better for topping with ooey gooey cheese!). Speaking of cheese, the key to the cachapas is to sprinkle them with a shredded soft cheese, fold in half, and eat while steaming hot. You can use queso mano, a soft mild cheese favored by Venezuelans, though shredded mozarella is a fine (and delicious) substitute. 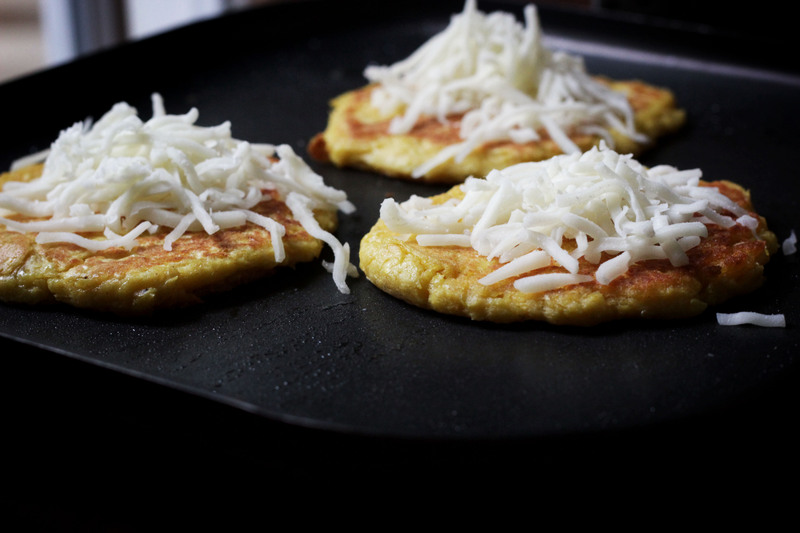 Some Venezuelans pass on the cheese, preferring to butter the cachapas. To begin our stovetop travels, set up your kitchen in a brightly lit kitchen. 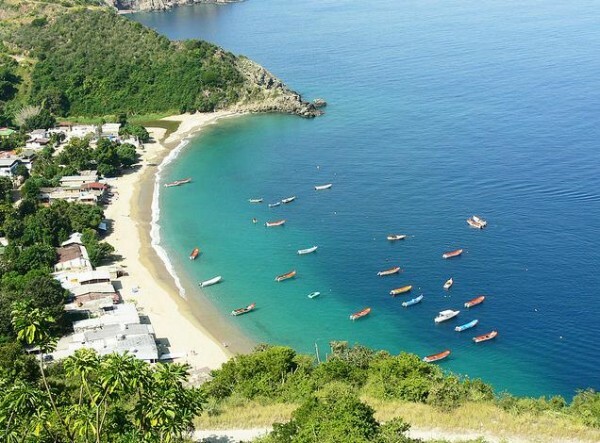 Beach of the west of Vargas State, Venezuela. Photo by Guillermo Gonzalez P.
Next, grind the corn kernels to a smooth pulp, along with the salt and pepper. Add in the masa harina. Note: You can use a food processor or a blender for this step. If you use a blender, you’ll need a tamper or long spoon to push the corn into the blade (not while the blender is running, of course!). Once the mixture is smooth, preheat a griddle or large frying pan over medium heat. Add on some oil, then spoon the batter onto the pan. With the back of your spoon, press the batter into a rough circle. Sprinkle with mozarella and let melt. 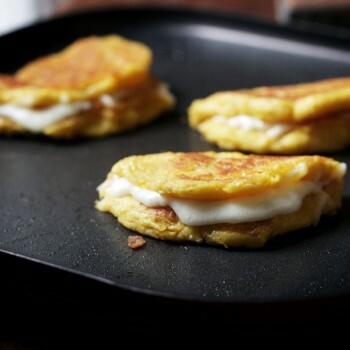 If necessary, keep warm in the oven until all cachapas are cooked. Each bite is soft, sweet, and cheesy. I mean. Really. Consider it an instant win. Think of them as the South American version of pancakes. The cakes are made with just two ingredients: corn and masa harina, plus the requisite sprinkling of salt and pepper. There’s a simplicity to the recipe that means a batch can be made as easily at midnight as in the afternoon. Which means you can stovetop travel to the beaches of Venezuela any time you like.While you can make cachapas with fresh corn in the fall, you can also use frozen corn any time of year. 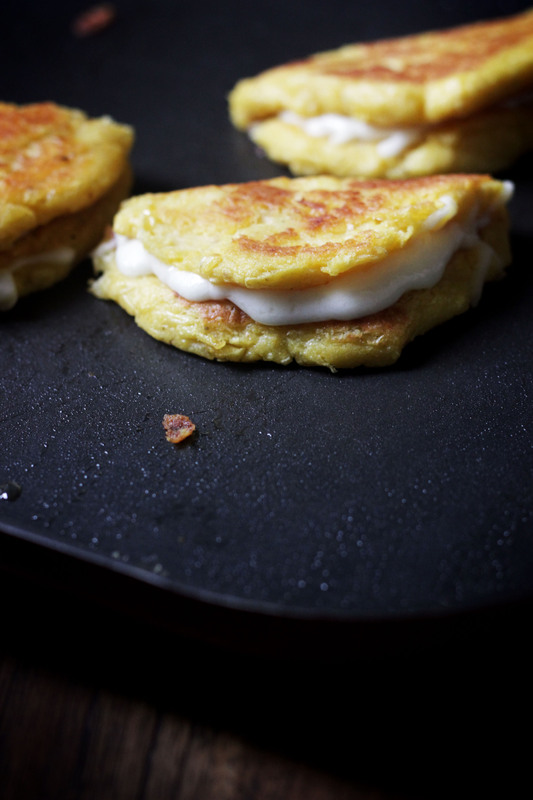 Corn gives the cachapas sweet overtones. Masa harina – a flour made from hominy, the big-kerneled cousin to corn – binds the mixture together so the corncake holds its shape (all the better for topping with ooey gooey cheese! ).Speaking of cheese, the key to the cachapas is to sprinkle them with a shredded soft cheese, fold in half, and eat while steaming hot. You can use queso mano, a soft mild cheese favored by Venezuelans, though shredded mozarella is a fine (and delicious) substitute. Some Venezuelans pass on the cheese, preferring to butter the cachapas. 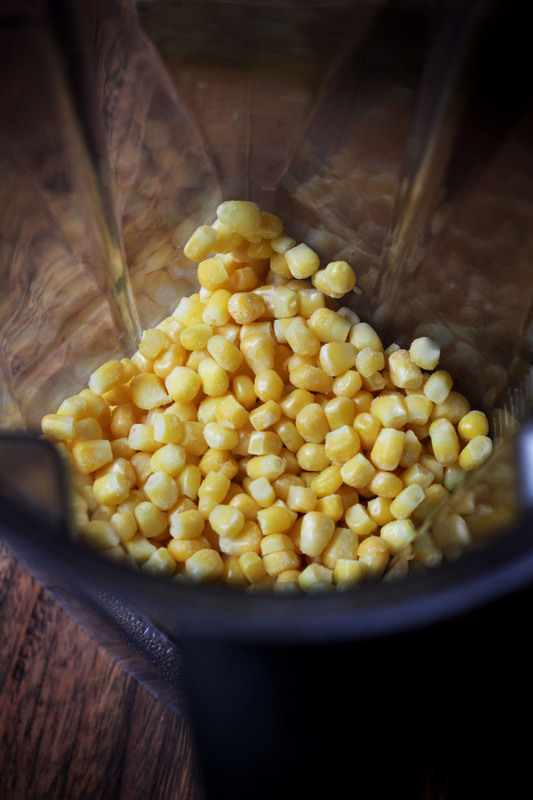 Grind the corn kernels to a smooth pulp, along with the salt and pepper. Add in the masa harina. Note: You can use a food processor or a blender for this step. If you use a blender, you’ll need a tamper or long spoon to push the corn into the blade (not while the blender is running, of course!). Once the mixture is smooth, preheat a griddle or large frying pan over medium heat.Add on some oil, then spoon the batter onto the pan. With the back of your spoon, press the batter into a rough circle. this looks awesome. I will have to try. I will defintely try these. Looks great! I could not find masa harina at my grocery store. They did have “corn flour”, would that work? What about regular all purpose flour? I know that wouldn’t be authentic & probably would not taste as good but would it be an acceptable substitute? They look delicious and I’d really like to try them! Well, normally we make cachapas without using any type of flour =) … If the corn seems too dry after grinding, we add a little milk. If it’s too runny, you can add a little flour: we use pre-cooked corn flour, but cornmeal also works, just be careful it’s not too dry. Hey Luis… Do you mean you use fresh corn in this way? Or is it dried kernels? This is so interesting! Amen to this, real cachapas do not use any flour. If you tried them in Venezuela and they did this, they did not know how to make them or they had bad corn. Gosh, these are totally easy and look delicious! Just found your website and can’t wait to see what else you have! Thank you!!! 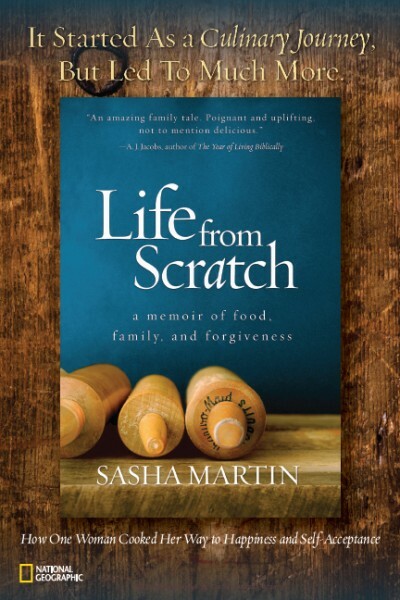 I’m sorry to say, but this recipe was a complete flop for me. I tried making the cachapas twice, following the recipe exactly the first time, and then adding butter and more masa the second time. 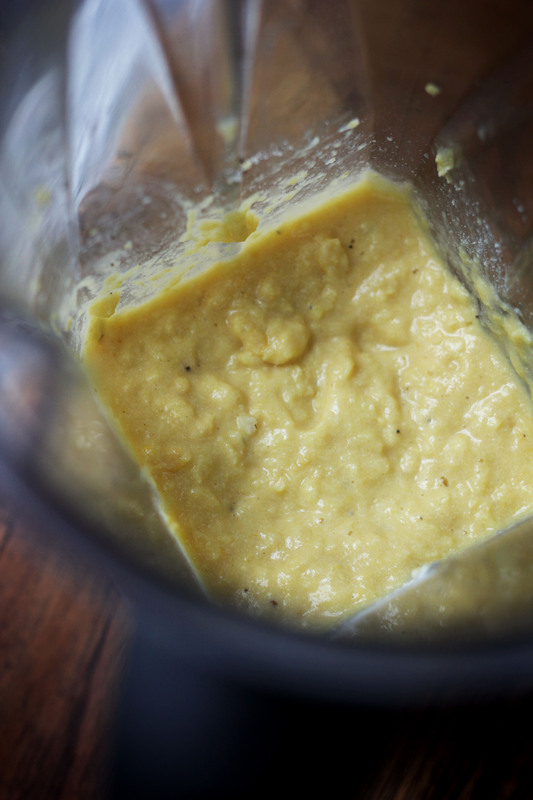 Both times I ended up with a messy, seared corn puree that just fell apart. Perhaps an egg is needed to bind the mix? Regardless, I think something in your cooking method is getting lost in this recipe as the photos show proper cachapas. Hey Josh – I’m sorry to hear this didn’t work for you. It sounds like yours was too wet somehow… I was also surprised that it didn’t need any binder, but every recipe I researched had this method. I think try it without the added butter, but more masa (your corn might have been wetter than mine) – see how that goes. Again so sorry! Pingback: 24 Pancakes From Around The World - zdouf! 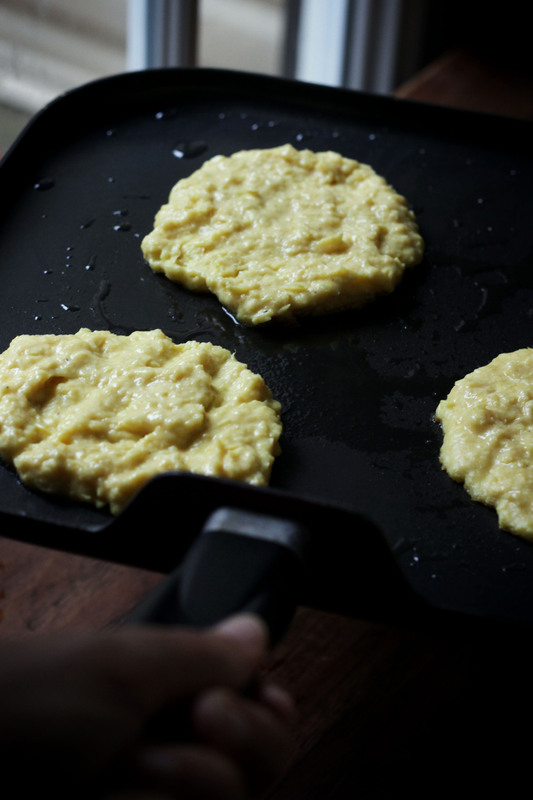 Is not necessary to add masa harina, im venezuelan, cachapas are made only with corn, water, salt and sugar; do not add pepper, and do not add milk, it is not necessary, ground corn very well, add water, a pinch of salt and sugar ( not too much ), mix well and cook in a greased hot iron pan, when it is cooked in one side, turn it and cover the pan to cook well ( sorry for my english)…. and then enjoy it! 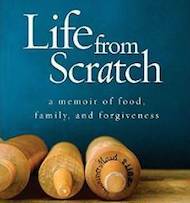 Your photo has been uploaded to the World Food Guide website. Most of the recipes I’ve looked at do no use masa harina, but corn flour. Masa is Central American as far as I know: corn kernels soaked in calcium hydroxide solution, a process called nixtamalization (sp). I’m no chemist, but when masa is eaten with beans, you get a complete protein. 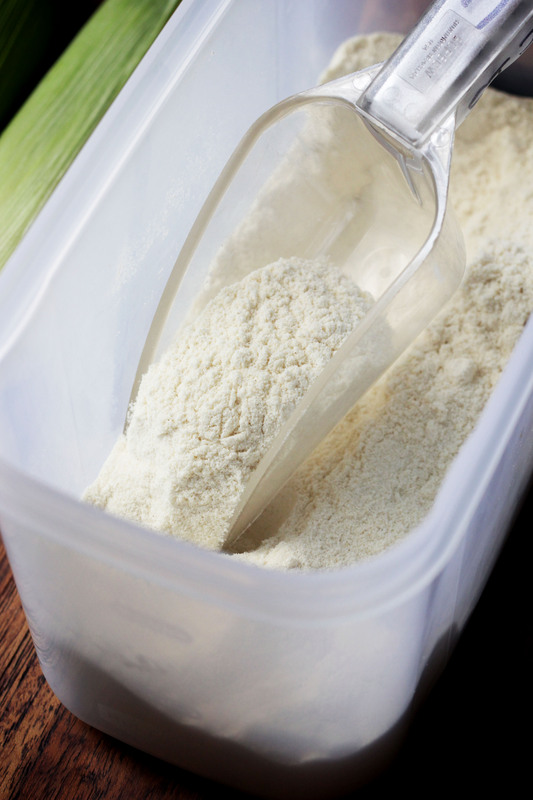 With just corn, corn flour, or corn meal, the protein is incomplete.